Jen Paterson is a skin and facial specialist. She has been in her thriving industry for 20years. 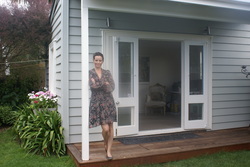 Before having her young children she was the owner and head operator of a successful clinic in Ponsonby Auckland. In this article she shares her beliefs on fighting the aging process. As we age, especially after 30yrs, your skin starts to take longer to regenerate and can appear dull, lined and mottled in appearance, therefore it becomes increasingly more important to look after your skins health. As a specialist it’s my main aim to get your skin into peak condition. To achieve this I offer a range of vitamin infusion facials to stimulate the regeneration of new skin and hydrate. To gain a smoother & brighter look to the epidermis (outer layers of the skin) there are a number of acids & enzymes that can be applied at varying strengths. You can experience a beautiful one off “pick me up” facial or for the more serious results driven person join “skin boot camp” to bring your skin into peak glowing health! All facials have a strong attention to detail and are tailor made to suit the individual. What you apply to your skin everyday has a huge impact to your skins overall appearance and health. There are key specific ingredients within skincare that are important to fight aging – antioxidants, vitamin C, A and growth factors are essential. Sunblock is a must. Internally essential fatty acids like flax seed oil or fish oils can help with an impaired skin. I believe not only can you get your body into peak fitness, with attention, you can achieve this with your skin too and this is a far more rewarding alternative to Botox and fillers!